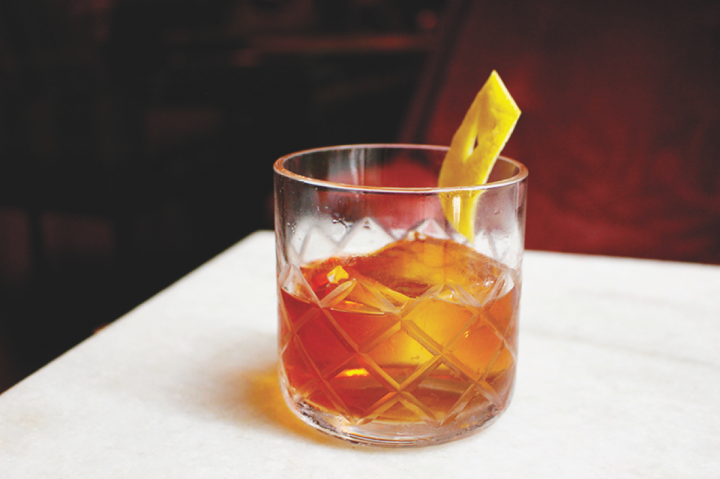 Jess Lambert brings personal flair to classic drinks at Boleo and Vol. 39 in Chicago. Though Jess Lambert has been in hospitality for 20 years and bartending for 12, she credits a visit to San Diego restaurant and cocktail bar Craft & Commerce in 2010 with sparking her interest in the world of craft cocktail making. “Sitting at Craft & Commerce, my world turned upside down and I fell in love with cocktails,” she says. Lambert went on to secure a spot in Tales of the Cocktail’s prestigious Cocktail Apprentice Program in 2014 at the encouragement of Mike Ryan, who led the program at the time. 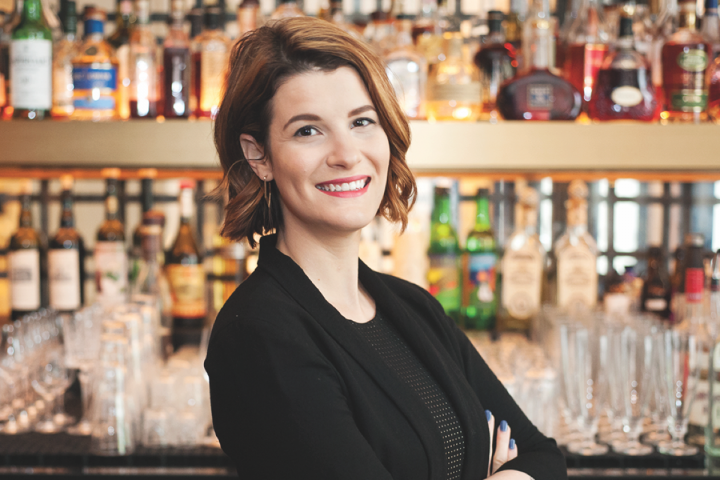 She graduated to “Grey Coat” leader the following year, and in 2016 joined the bar team at Chicago’s Kimpton Gray Hotel, where Ryan serves as director of bars. As head bartender of both Boleo, the hotel’s rooftop South American-inspired lounge, and Vol. 39, its more traditional high-end cocktail bar, Lambert is charged with creating drinks that run the gamut from fun and fruity to sophisticated and bold. At Boleo, the experimental drinks feature tropical flavors from fresh fruits, spices, and herbs, plus spirits from around the world. The menu ($10-$14 for single-serve drinks; $60-$85 for punches serving 6-8) is divided into several sections, with one, called “Drink Like You Give A…,” dedicated to cocktails that reduce waste and environmental impact by featuring recycled ingredients. Lambert’s One Last Chance from that section comprises Suntory Toki whisky, Rhine Hall La Normande pommeau, house-made French toast café orgeat syrup, lemon juice, egg white, and Topo Chico mineral water. 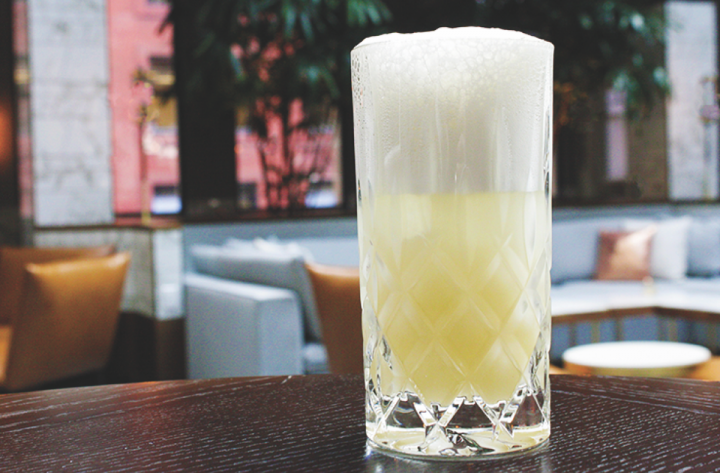 The syrup in this Japanese Highball-inspired drink features leftover bread from the hotel’s kitchen. Meanwhile, the Vol. 39 cocktail menu (drinks are $14-$35) sticks to more classic builds, including numerous Martini variations as well as several Old Fashioneds. Lambert’s Rye Old Fashioned #4 ($16) blends Lot 40 Rye whiskey, Björk Birch liqueur, Fonseca Siroco White Port, Sassy Palm Demerara syrup, Angostura bitters, Weatherby’s Cola, and 11th Orchard Birch bitters, and saline. “Every drink I make has a classic cocktail framework, but I try to push boundaries and challenge myself to innovate, keep people on their toes, and do what’s unexpected,” Lambert says. Combine rye, liqueur, Port, syrup, and saline in a mixing glass. Add bitters and ice and stir for 10-15 seconds. Strain into a rocks glass over fresh ice. Garnish with expressed lemon swath. Combine whisky, pommeau, orgeat, and lemon juice in a cocktail shaker. Add egg white and dry shake for 10 seconds. Add ice and shake very hard for 25 seconds. Strain into a Collins glass. Add 3 ice cubes to glass. Slowly top with Topo Chico. Garnish with freshly grated cinnamon. 1In a dry saucepan, toast 710 grams raw, sliced, skin-on almonds and 2 cinnamon sticks until golden brown and fragrant. Stir often to avoid burning. In a vacuum bag, add toasted spices, 1 tablespoon maple flavor, ¼ teaspoon Madagascar vanilla bean paste, 1893 grams granulated sugar, 1.8 liters water, and a pinch of salt. Whisk to combine as much as possible. Vacuum seal and sous vide at 135 degrees for 1-2 hours. Strain prior to use. 2Toast about 6 pieces of almost stale bread in a 400º oven for 5 minutes or until golden brown. Remove from oven and let cool. In a blender, add syrup made earlier and toasted bread. Blitz on high, then fine strain.